Is Crypto in a "Caged Bull" Market? Looking at the BitCoin price drop and a lot of the opinings from the “experts” out there, it’s obvious Bitcoin and in fact all of Crypto is in a huge bear market. In fact, you should run to your computer and dump your crypto as fast as you can… just listen to all the talking heads and you’ll know… it’s worthless… will never amount to anything… and is a huge ponzi scheme… this is called spreading FUD (Fear Uncertainty Doubt). But wait… if you dig a little and read some news you’ll see that there’s lots of activity by big firms like JP Morgan, Goldman Sachs, even NASDAQ, getting into crypto. Across the board they’re doing this, but they’re keeping it on the “down-low” as long as they can. Dig and you’ll find patents on crypto this and that and blockchain this and that. They say 2 different thing all the time: big headlines questioning crypto, and then if you dig you’ll find other news stories where they’re exploring it, adding products to support it, adding divisions, etc… (and accumulating it while it’s cheap). These corporations and people have deep, deep pockets. They can manipulate entire fiat markets, so crypto is child’s play for them to manipulate. Start reading and discerning what’s behind a lot of the news. I’m not a financial adviser so I’m not going to point you to exact articles and tell you exactly what to do: you draw your own conclusions. 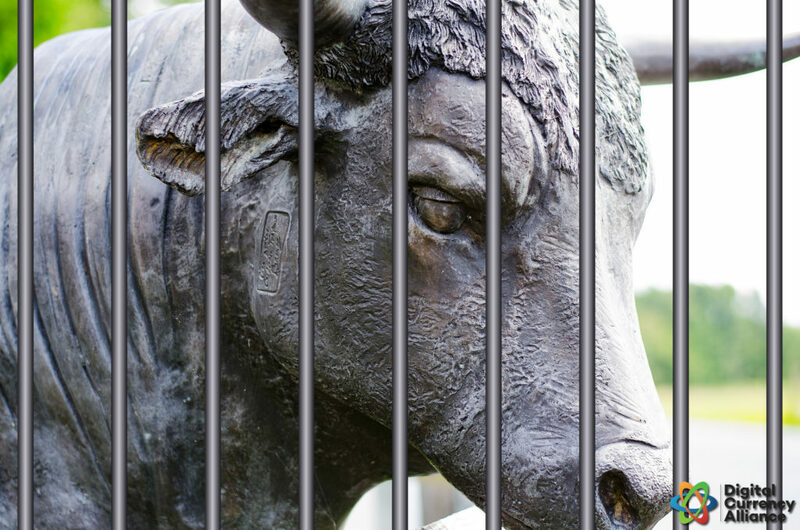 How Long Will the Bull Stay Caged? I keep telling people to get into crypto while it’s cheap. Once the big guys decide it’s time for digital currency to go up, you’ll realize we’ve not been in a bear market, but rather a caged bull market! You can use your spare change to start accumulating Bitcoin and Ethereum! P.S. Sign up to my email list to get notified when I make blog posts like this one: Subscribe.